This is a little hole-in-the-wall joint I'm almost hesitant to share because it's that awesome and, like a jealous boyfriend, I'm kind of conflicted about this place attracting any more attention. But then again, it's already famous with the locals so I guess it's not a big deal. Why is it so awesome you ask? 3. And it's really, REALLY generous. Be still, my heart (and stomach). Located behind the YBM in Jongno, Ddookbaegi Jib specializes in simple stews served in the earthenware pots from which the joint gets its name. The menu is very simple, giving you an option of the dwenjang jjigae (bean paste stew), the ooreong dwenjang jjigae (bean paste stew with soft shell clams in it), kimchi jjigae (kimchi stew) and soondubu jjigae. The amazing thing about this place is its unbelievable prices. The ooreong dwenjang jjigae and the kimchi jjigae will only set you back 5,000 won while the soondubu and dwenjang goes for only 4,500 won. Part of me is a little sad because the prices used to be like 3,000 won just a few years ago but hey, at 4,500 ~ 5,000 won, for lunch or dinner, this is still an unbelievable deal in today's age. Ddookbaegi Jib is a long-run institution which has been around for some 30 plus years. The place is usually pretty packed with a mix of young and old. Tables and seating is pretty limited and at busy times, the gruff ajummas may even guide you to a table with other strangers but shut it- you're here to eat a lot of good food for cheap anyways. Fret not though, as you won't be sharing stews or side dishes with your new eating companions. An ajumma is always stationed at the large gas grill by the window, visible from both outside and inside the restaurant, surrounded by stacks of the pots. Make your order and she'll get working on your pot which will soon be bubbling away on the stove. 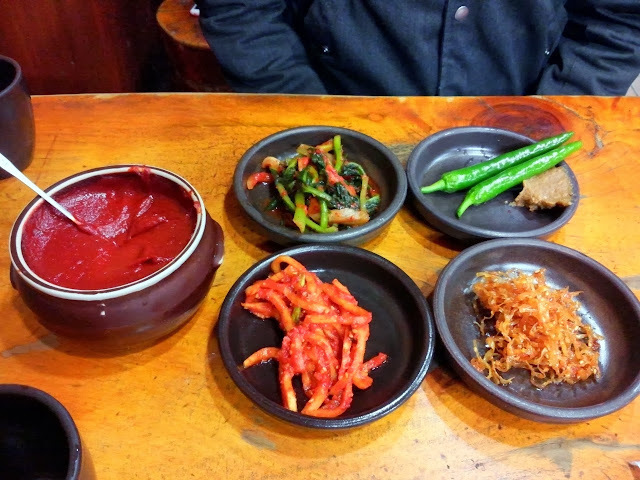 The banchan (side dishes) here are very basic but made fresh daily and changes according to what's in season. When I went this time it was some yeolmu kimchi (young radish stem kimchi), seasoned squid strips, seasoned radish and some green peppers and dwenjang (bean paste). You can taste that it's homemade and fresh and the restaurant explicitly reassures on signs saying they never reuse the banchans so you can dig in without fear. Then comes your rice. In a big metal bowl, a squirt of sesame oil is added, some cooked soybean sprouts and then rice scooped on top. Add in the side dishes you want, a couple of spoons of your stew (if you wish) and a scoop of their homemade red pepper paste provided on each table and give it all a mix for your own bibimbap. As you can see in the picture here, the mound of rice is enormous. The ajummas dishes out the rice according to how much they think you eat (generally a smaller portion for women and more for the bigger framed guys). But worry not big eaters of all genders and sizes, if you ask for more rice, they'll give you more. Omit/add what you want, mix and enjoy your very own bibimbap. 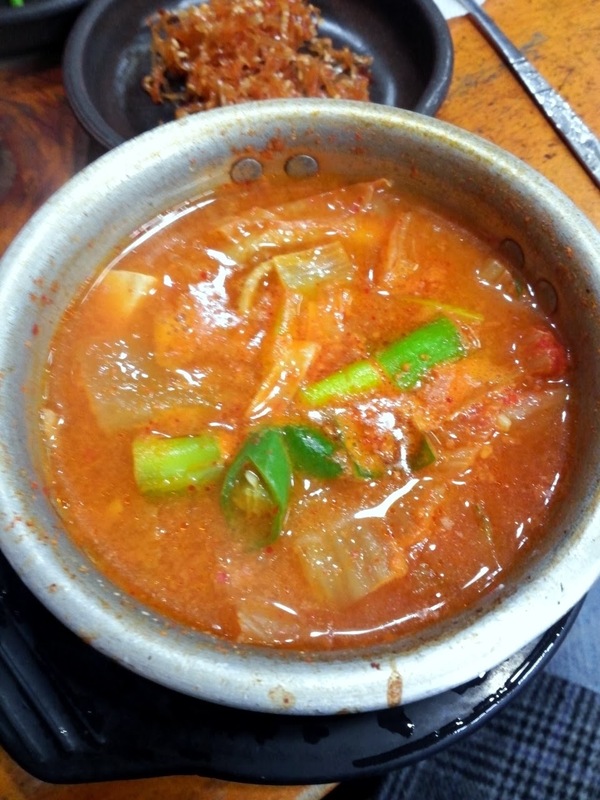 My friend went for the kimchi jjigae while I went for the dwenjang jjigae. 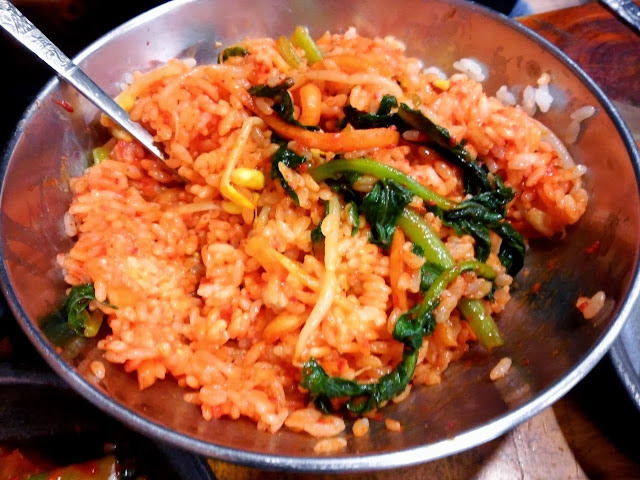 All the ddokbaegis come bubbling away and already wanting to be best friends with your colorful bibimbap. 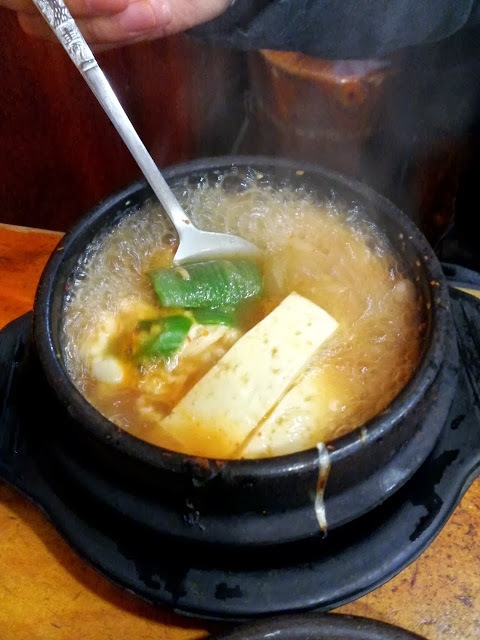 The dwenjang jjigae is simple with tofu, zucchini slices, mushrooms, green onions, onions and whatnot. The soup has a nice savory depth to it which is aided by the broth being made from bajirak (바지락), aka little manila clams. The interesting thing about this place is that they add a cracked egg to their dwenjang jjigae. I thought the first time it had mistakenly gotten in after being confused for a soondubu jjigae but nope, a nice little egg is hidden underneath all the goodies giving you a nice little surprise. The kimchi jjigae is decent and standard with your aged kimchi, tofu and whatnot. It's a bit on the tart side and very gingerly so it might not be everyone's cup of tea. I probably wouldn't opt for it on future visits but it'll still be better than your neighborhood kimbap place. Scanning around, the soondubu and the ooreong dwenjang jjigae seemed to be quite the popular picks so I'll definitely have to try it out on future visits. But simply put, this is fine quality food (and a generous amount at that) for some really awesome prices so if you're in the vicinity and wanting an inexpensive but home cooked meal, there's no other place I'd recommend in the area. It's beyond better in quality, price and portions than your neighborhood kimbap joint and better than most established chain places in the area as well. As Ddokbaegi Jib proves, sometimes it's simple done right that makes a place really stand out. I know if I lived close by I'd probably come here all the time on the lazier days. Maybe that's a good thing. 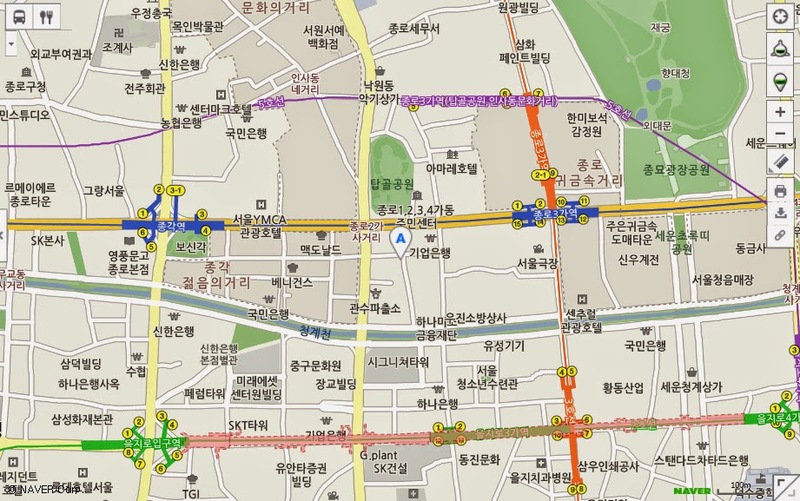 Hearty, Korean meals with unbelievable prices and enormous portions. 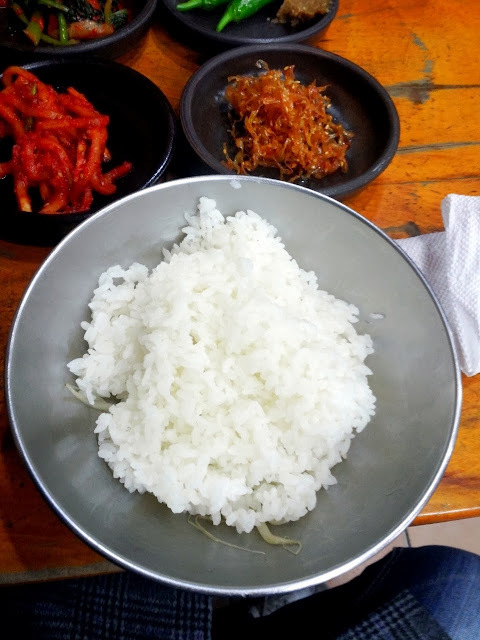 This is THE place to get a real, no-frills Korean meal in the Jongno area and there's a reason behind its immense popularity. Some of the dishes can be a tad salty but other than that, absolutely perfect. Tip: Peak times like weekday lunch can get packed easily so try and get there early.